This evening I get to add another beer style to my list that I've reviewed on Beer O'Clock Australia; American Wild Ale. Basically it's a beer which has had "wild" yeast or bacteria (such as Brett) added to give a funky sour flavour. The very nature of the style dictates that it is very hard to produce a consistent flavour across a number of brews, so each batch can differ greatly. It's a style that splits beer drinkers, you either love them or hate them. I'm about to find out which category I fit into. Trust MoonDog, my local crazy micro brewers, to come up a beer like this. For those who recognise the name but can't quite place it, Mr Mistoffelees is the name of one of the lead characters from the musical Cats. MoonDog's Mr. Mistoffelees pours more like a cordial than a beer. The colour is an almost luminescent orange colour, which really sparkles in the light. There's plenty of carbonation but it doesn't seem to produce much of a head as the white foam on top of the beer last no more than 30 seconds. I can also notice a few flecks of white sediment that I assume are a by product of the wild yeast addition. 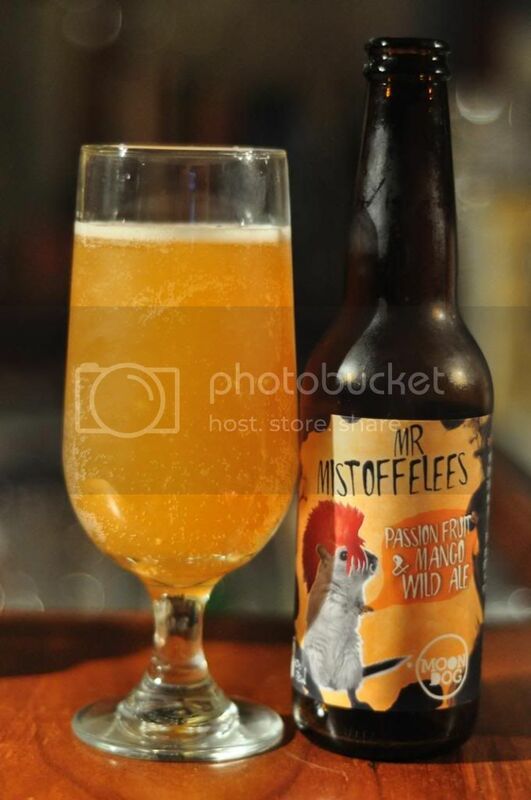 I think I forgot to mention this earlier but Mr Mistoffelees is termed a "Passionfruit & Mango Wild Ale". This certainly becomes apparent when you smell this beer. Huge hits of passionfruit dominate the nose with mango evident underneath. The mango that comes through is quite tart although clearly in the background to the passionfruit. There's the tiniest hint of some Belgian funk, but not a noticeable amount on the nose. Much like the nose, passionfruit dominates the taste of MoonDog's Mr Mistoffelees. The passionfruit flavour mellows a little as the beer warms and is replaced by a tart, almost acidic, mango flavour. There is plenty of Belgian funk about this beer and at times it has an almost salty flavour to go with the excellent fruit flavour. This certainly isn't the normal beer you'd find in the fruit beer section, but it's one of the best I've had! What an absolutely fabulous sour beer! I haven't sampled a heap of sours but this is one of my favourite beers full stop! I'm going to buy a couple more to confirm that I wasn't just drunk and in love with it for no reason, but I'm pretty sure it's the real deal. It's definitely my favourite MoonDog beer and a beer I would recommend to all fruit and sour beer drinkers.